The twenty-year-old central defender was signed for Rushden & Diamonds on 18 August 2009, shortly after the start of the 2009-10 season. Bobby had started his career with Peterborough United as a youth player, moving to Wingate & Finchley in 2007 after being released. Bobby was on trial at the Diamonds this summer, playing in the 2-2 draw against Corby Town and the Diamonds XI games against Raunds Town and Brentwood Town. He had also played for the Nigerian Under 19s side prior to his arrival at Nene Park. In mid-September 2009 he went out on loan to Kings Lynn, managed by former Diamond Carl Heggs in order to gain experience and first team football. Whilst still on that loan he made his debut appearance in Diamonds first team colours in the Hillier Cup game against Daventry United on 13 October 2009. He then returned to play for the Linnets in their FA Trophy game at Marine, alongside Heggs and another former Diamond – Owen Story. He then moved to Kings Lynn on a permanent basis at the end of October 2009, but found himself without a club after the Northern Premier League side were wound up in November 2009. He signed for Conference North side Alfreton Town on 11 December 2009, before moving on to Billericay Town in March 2010. In August, Bobby signed for Conference South sideDover Athletic, but moved to fellow Conference South side Boreham Wood in December. He was released in February 2011. In August 2011, Bobby re-signed for Wingate & Finchley following their promotion to the Isthmian League Premier Division. 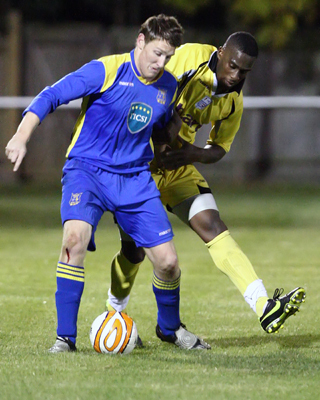 After suffering an injury, he went on a one month loan to Isthmian Division One North side Cheshunt on 1 October 2013 in order to regain fitness, returning to Wingate and Finchley in early November. Just after the start of the following season, Bobby returned once again to Isthmian Division One North side Cheshunt on 14 August 2014. He left the game to focus on his career as a Personal Trainer.